I mused a few days ago about Sarah's Media silence, her refusal of interview offers and how it would be broken before Thanksgiving and how she would certainly make sure her first appearance was on FOX. Well folks, she didn't even make it a week. Sarah and Greta BFF. What the heck is with the hood-head hair? 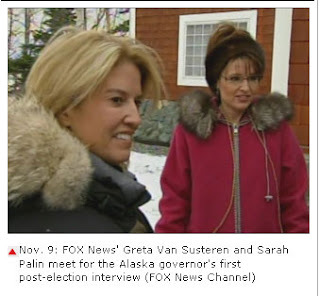 FOX News' Greta Van Susteren is in Alaska to get Gov. Sarah Palin's reflections on the presidential election. Watch FOX News' "On The Record With Greta Van Susteren" Monday night at 10 p.m. ET to see Palin's interview. Wow, not even a week. Are those kids back in school yet? How are things at the office? Find all those missing clothes yet? Seems like Sarah should have plenty to focus on.